The town of Hunts Point occupies a small peninsula and is one of the most revered communities in the Pacific Northwest. It’s surrounded by Lake Washington just east of Bellevue, near the suburbs of Medina, Clyde Hill and Yarrow Point. 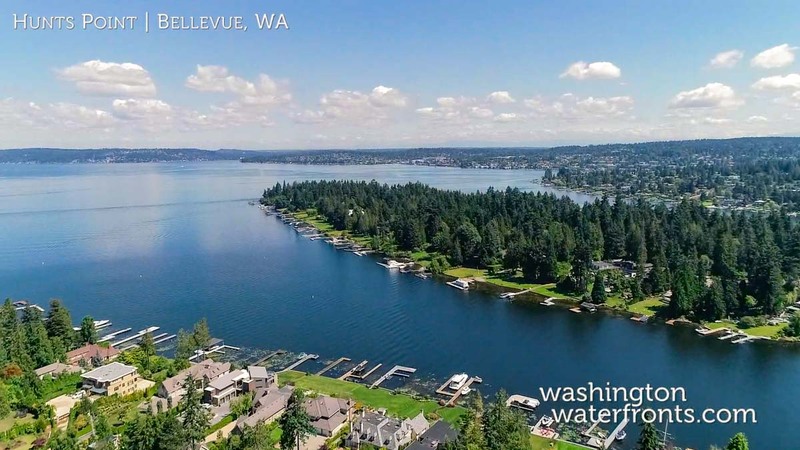 It functions like a neighborhood of Bellevue, with its main road, Hunts Point Drive/84 th Ave NE lined with multi-million-dollar gated estates. Home to less than 500 residents, it’s one of the smallest municipalities in Western Washington, yet it’s also one of the most desirable places to live with its breathtaking scenery and ideal Eastside location offering easy access to Seattle. Hunts Point waterfront real estate offers plenty of privacy in an urban forested area, with most lots over an acre and difficult to see from the street. When you own Hunts Point waterfront real estate you’ll be owning a true slice of the good life, with unsurpassed access to Lake Washington, its magnificent sunset, water and mountain vistas, as well as all of the activities it offers from sailing and boating to kayaking, fishing and more. Its commitment to greenery makes it even more desirable – in fact, it’s been designated “Tree City, USA” by the National Arbor Foundation since 1991. While Hunts Point waterfront real estate offers the chance to be immersed in a nature lover’s paradise, residents are just minutes away from the city of Bellevue and its famous shopping opportunities with everything from elegant boutiques to larger high-end stores and malls. Just about any type of cuisine can be found here too, including local delights like fresh seafood and sushi to a wide range of international fare. After a hard day’s work or a day of play, you can expect to come home to the ultimate in relaxation, with many grand homes among Hunts Point waterfront real estate, including luxurious details like a wall of windows that seamlessly allures you an outdoor dining space for sipping wine while gazing at some of the most impressive views imaginable. Take advantage of our industry-leading tools to make your property search as easy as possible and be sure to register for a FREE account so that you can receive email alerts whenever new Hunts Point real estate for sale hits the market. If you’re seeking to sell your Hunts Point property, contact our Waterfront Specialists directly for a comprehensive listing analysis and to learn more about the cutting-edge marketing strategies we’ll use to sell your home quickly for top dollar!